Each week, I'll be preparing you for the Patriots upcoming opponent with a scouting report, going over the opponent's roster with a focus on how they will specifically match up with the Patriots. This week, the Pats will look to build on last weeks rebound performance against the 1-1 Texans, who like the Patriots bounced back from a rough season opener with a win last week. 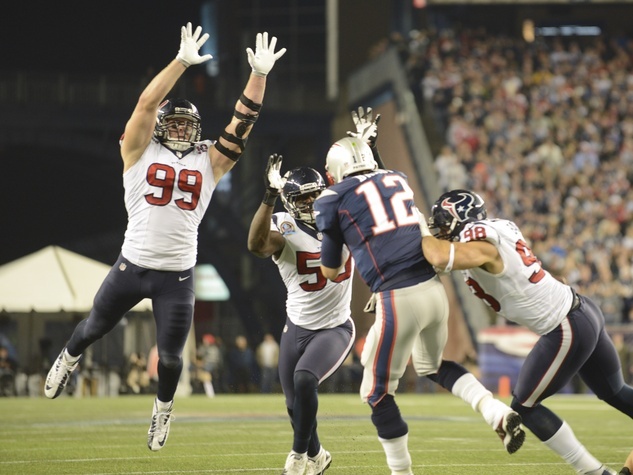 The Texans boast an impressive defense that has given Tom Brady issues in the past. They also bring a degree of uncertainty preparation-wise, as rookie quarterback Deshaun Watson will be making just his second career start. Without further ado, here's a closer look at the matchups that should play out on the field Sunday. 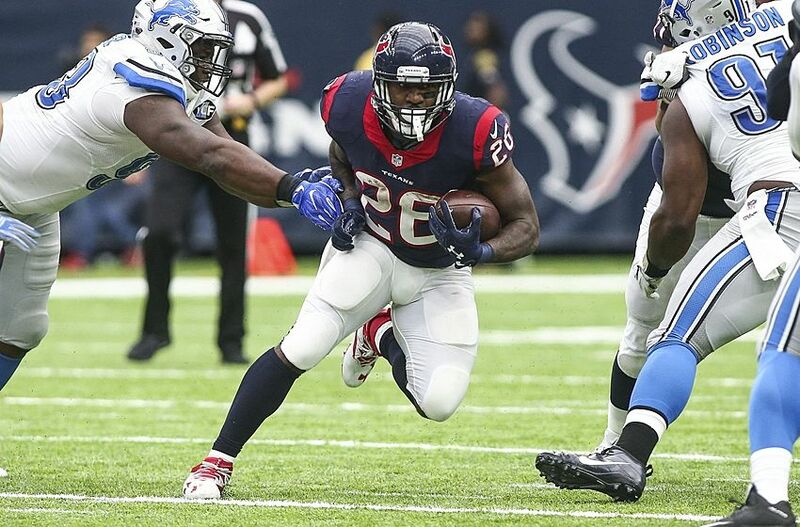 You don’t need me to tell you that the Texans offense has been bad through two weeks. They got absolutely run over by Jacksonville’s young talent, allowing 10 sacks and committing four turnovers in a 29-7 season-opening shellacking. They weren’t much better in Week 2, when they won despite managing just 13 points in rookie quarterback Deshaun Watson’s first start. While he wound up with his first career win, Watson wasn’t particularly great as a passer against the Bengals. 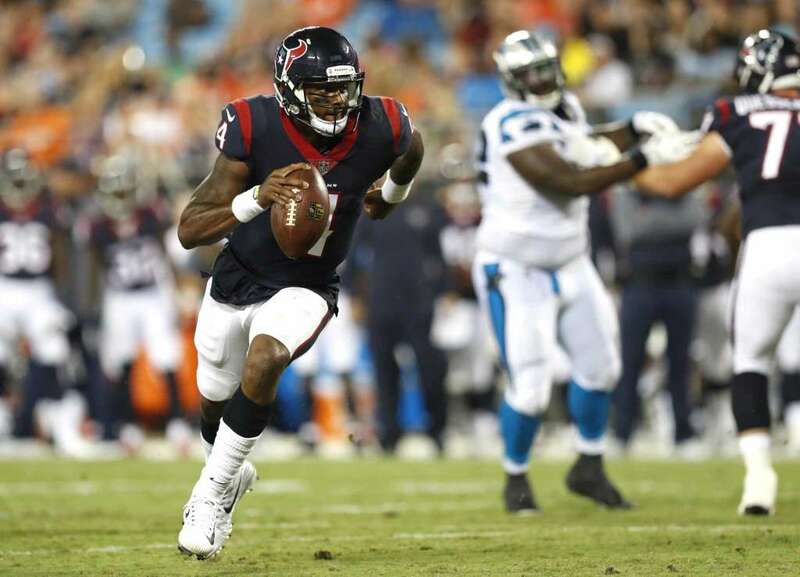 However, given the context of him being a rookie converting from a college spread to Bill O’Brien’s complex pro style schemes, Watson’s performance was encouraging. He completed 62% of his passes, avoided turnovers and did some serious damage with his legs, rushing 5 times for 67 yards and his team’s only touchdown, a 49 yard scamper. The Texans certainly used their playcalling to ease the burden on their rookie starter. They ran the ball a whopping 35 times, gaining 168 of their 266 yards on the ground. Watson only threw 24 passes (he was also sacked three times), with most of them of the dink and dunk variety. He managed just 125 yards, averaging a paltry 8.3 yards per completion. Skill position players not named DeAndre Hopkins combined for just 8 receptions and 52 yards. The final rushing numbers looked decent against the Bengals, but they were inflated a bit by Watson’s long run, which was a scramble rather than a designed play. Take that out of the equation and you have a 34 attempt, 119 yard, 3.5 yard per attempt slog. The Texans weren’t helped by the predictability of their play calling. With no healthy tight ends available, rookie third tackle Julie'n Davenport (#70)played 30 snaps as a blocking tight end, a la Cameron Fleming. Some power formations also brought reserve guard Kyle Fuller (#61) on the field as a second “jumbo” tight end, giving the offense a two TE look with essentially seven offensive linemen. Despite the extra beef up front, the Bengals were able to bottle up feature back Lamar Miller (#26), holding him to 61 yards on his 18 carries (3.38 per). Rookie backup D’Onta Foreman (#27) fared no better, mustering just 40 yards on 12 totes (3.33). Both backs have plenty of talent, but they’ve been facing poor blocking and loaded up boxed designed to take away the run. The versatile Miller is one of the better every down backs in the league. He’s adept on third down, both as an outlet receiver and in protection, and has a proven track record of success as a ball carrier. His slashing style is a good fit for the zone blocking scheme the Texans employ, as he has good vision, excellent cutting ability and the speed to do serious damage if given a crease. The change-of-pace rookie Foreman is significantly bigger (6’1”, 236 vs 5’11”, 215), with impressively quick feet and big play ability for a man his size. He was a standout last season at Texas and this August in the preseason, including an eye-opening performance against your Patriots. Ball security was a major knock on him as a prospect coming out in the draft and I’d expect Patriots defenders to know that whenever they get within striking distance of him. The final member of this backfield committee is Tyler Erving (#34), who serves as the passing down back. Erving has played 53 passing down snaps against just 20 running plays, with only three carries. With the Texans receiver depth decimated by an injury to Will Fuller V and suspension to since released Jaelen Strong, Ervin has seen plenty of work in the slot, where the Texans will try to isolate his quickness against linebackers. In a conservative, checkdown heavy passing offense, he ranks second on the team in targets (with only 10). He’s reliably caught those checkdowns but has done little with them, managing just 34 yards on his 7 catches (4.9 per). Rookie quarterbacks historically tend to lock onto one favorite target, and last week proved that star receiver DeAndre Hopkins (#10) is that guy for Watson. The man called Nuk was targeted on more than half of Watson’s attempted passes (13 of 24), catching 7 of them for 73 yards. That statline doesn’t including his drawing a penalty from Pacman Jones after beating the veteran cleanly downfield, resulting in another chunk gain for the Houston offense. It does include several trademark acrobatic catches from the star whose innate ball tracking ability has been proven by years of gaudy production despite inept quarterback pay. While not the biggest or fastest guy, Hopkin’s route running ability and knack for winning 50/50 balls makes him a huge threat. In past matchups, the Patriots had used Logan Ryan on Hopkins, often with safety help over the top. With Ryan now a Tennessee Titan, I’d expect Stephon Gilmore to get the lions share of the snaps on Nuk, with his length and athleticism making him the best candidate to disrupt those contested catch opportunities for Hopkins. With Watson wanting to lean on his star playmaker again, I'd expect the Pats to continue to use bracket coverage against Hopkins, with a safety over the top of Gilmore on most snaps. 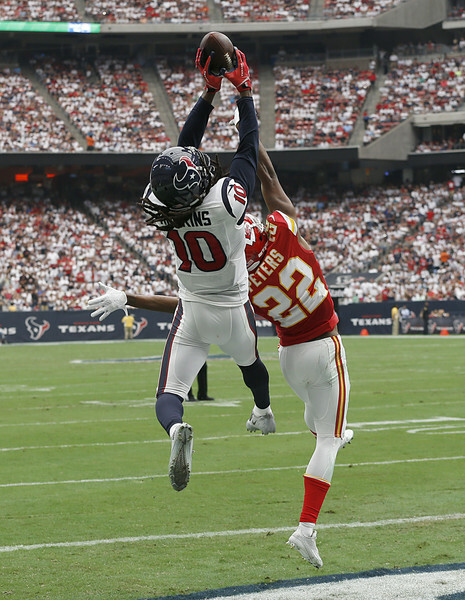 Doing so will make it very difficult for Watson to feed his number one target, and taking away Hopkins could severely cripple the already poor Houston offense. With Fuller still out, Braxton Miller (#13) has played alongside Hopkins in two receiver sets. A star quarterback at Ohio State, Miller is a freak athlete but still raw and early in his transition to receiver. He’s caught just two balls for 10 yards this season despite nearly playing wire-to-wire in both games. That lack of production could mean his snaps are reduced this week, as Bruce Ellington (#12) is expected to return after missing last week with a concussion. Ellington is more of a quickness based slot receiver who showed off his big play speed against Malcolm Butler and the Patriots starters back in the preseason. When the Texans go three wide, I’d expect the Pats to counter with Butler on Ellington and Eric Rowe on the 6’2” Miller, with Jonathan Jones also likely to get in on the rotation after last week’s excellent performance in spot duty. Jones gives the Pats depth should either Gilmore or Rowe further aggravate the groin injuries they are dealing with in game. While CJ Fiedorowicz isn’t walking through that door anytime soon, the return of Stephen Anderson (#89) and Ryan Griffin (#84) from concussions gives the Texans two more healthy tight ends than the zero they played with last week. Both are far more adept at catching the ball than blocking, but neither passes for an explosive “weapon” in the offense. I’d expect second year UDFA Anderson to play the bulk of the snaps, particularly in passing situations. giving Patrick Chung an ideal assignment for a bounce back game following last weeks rough outing in coverage. On running downs, I wouldn’t be surprised if the Texans continue to use the jumbo packages featuring Davenport and sometimes Fuller as run blocking tight ends. 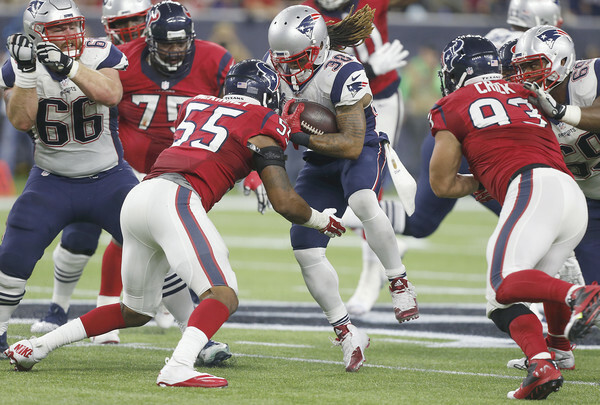 The Patriots can comfortably counter those power sets (which also feature veteran fullback Jay Prosch (#45)) with base defense and heavier personnel, as the Will Fuller-less Texans lack a true vertical threat to make defenses pay for loading up the box against them. The Patriots defensive line had a nice bounce back effort against the Saints and might be facing an even weaker line than that injury ravaged New Orleans group. 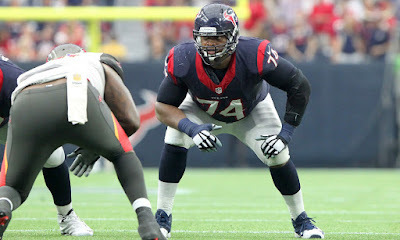 With star left tackle Duane Brown continuing to hold out and starting right tackle Derek Newton out indefinitely with a brutal knee injury, the line has seen plenty of moving parts. 2015 UDFA Kendall Lamm (#63) won the starting job on the blindside out of camp, but was bad enough to be benched for veteran turnstile Chris Clark (#74) midway through the brutal week one loss. The right side is manned by former Jet Breno Giacomini (#68), who is visibly slowing down at age 31 and hasn’t been a quality stater in years. The athletic rookie Davenport is the swing tackle. He has high upside as a pass protector but, like many rookies, he’s still a little light and gets pushed around by bigger, stronger players at this point in his career. Things are only slightly better on the interior. The bright spot has been center Nick Martin (#66), last year’s second round pick (and yes, the younger brother of Cowboys star Zach). Still a rookie after losing all of last year to ankle surgery, Martin has looked solid in his first career action. With starter Jeff Allen likely to remain sidelined with an ankle injury, veteran journeyman Greg Mancz (#65) will get another start at right guard. He’ll be bookending Xavier Su’a-Filo (#71), a 2014 second round pick who has looked like a bust far more often than the powerful road grader he was billed as coming out in the draft. Su’a-Filo has consistently graded out as one of the worst starting guards in the league, a trend that has continued so far this season. While the offensive line looks like a weakness that could be ripped to shreds, I’d expect the Patriots defense to devote plenty of attention to containing Watson in the pocket, rather than pressuring him with penetration. With Gilmore and safety help to throw at Hopkins, the one source of potential big plays for the Houston offense comes in the form of Watson’s legs, as he has the speed and improvisation skills to make defenses pay for poor gap discipline or edge control. Contain will be especially important for the edge rushing rotation of Trey Flowers, Deatrich Wise and Cassius Marsh. Expect them to focus on using their power to confine the pocket around Watson with bull rushes, rather than attacking the edge with speed and leaving themselves vulnerable to overrunning the play and leaving Watson an escape lane. This could be a more difficult assignment for Marsh, who is a little more reliant on his quickness as a rusher than the powerful Arkansas duo of Flowers and Wise. In fact this might be a game where Lawrence Guy could be more snaps on the outside as another power-based option, especially on early downs. Marsh’s athleticism could make him a candidate for another role: spying on Watson. The Patriots like to play games at the line regarding which players are rushing and which are dropping back in coverage, and they’ve dropped athletic edge guys in the past into spy positions against athletic quarterbacks. Marsh and rookie Harvey Langi give the Pats two athletes suited for that kind of a role, with both athletic enough to also cover the flat in certain zone schemes. Keeping a spy on Watson will be crucial, especially if the Pats decide to smother their receivers with man coverage. One vulnerability of man is that it allows receivers to “clear” defenders out of the shallow parts of the field, leaving them vulnerable to scrambling quarterbacks. Keeping at least one spy handy (sometimes that will be the work of a linebacker as well, likely Van Noy) gives the Pats an extra level of defense against Watson’s legs, keeping them prepared in the case that he does decide to take off. Of course, Watson is fast enough to make this a challenging assignment. Even with this extra attention, he could make a play or two on you with his legs simply by beating your spy one on one in the open field. For that reason, keeping him contained in the pocket will be critical for the defense. Look for the interior defense to focus on maintaining and clogging rush lanes, rather than generating upfield push. On paper, the Pats have the bodies to do it. Malcom Brown, Alan Branch and Guy all are built to hold their gap, even against multiple blockers. Discipline will be key in this one though; push too far upfield and you risk Watson stepping up and escaping right through the space you were just occupying. That could be particularly challenging for rookie Adam Butler, who is more of a quickness-based penetrator than a big, powerful gap controller. As long as the rush keeps the relatively inaccurate Watson stuck in the pocket, the defense should be able to suffocate his offense with their coverage ability. Here’s where things start to get scary. Houston’s offense may be poor, but this defense is very, very good. They were very good last year, when they frustrated Brady and the Pats offense for large chunks of their playoff game. They’ve since swapped out aging, ineffective and suspended linebacker Brian Cushing for impressive rookie Zach Cunningham, while welcoming the return of JJ Watt (#99), aka the best defensive player on the planet. The strength of this Texans defense comes from their vicious front seven, which boast star playmakers Whitney Mercilus (#59), Jadeveon Clowney (#90) and, of course, Watt. That front seven was the source of Brady’s frustrations back in the spring, as constant pressure threw Brady noticeably off his rhthym in the first half. Mercilus and Clowney man the edges as pass rushing outside linebackers in the Texans base 3-4 look. Watt moves all around the defensive line but his base position is as an interior 3-4 end. Second year man DJ Reader (#98) takes over nose tackle duties from the retired Vince Wilfork, where he’s shown well so far as a massive (6’3”, 335) space eater. Brandon Dunn (#92) gives the Texans some depth at that big bodied role, while second year UDFA Joel Heath (#93) rotates with Christian Covington (#95) at the interior end spot opposite Watt. Personnel-wise, there’s already problems across the board here. Nate Solder has played poorly through two weeks and the Pats will likely be without Marcus Cannon. As I write this, Cannon has yet to be cleared from the concussion protocol, which is obviously necessary for him to suit up on Sunday. Without him, the Pats would be left with the struggling Solder and likely the slow footed Cameron Fleming left to contend with the likes of Mercilus, Clowney and Watt on the edge. Inside, the massive Reader is a tough assignment for the undersized trio of Andrews, Thuney and Mason, all of whom struggle at times with bigger guys one on one. Then there’s Watt, a dominant force capable of lining up anywhere on the line and beating anyone with speed or power. The fact that Watt typically rushes on the defensive left side (against the right tackle) makes Cannon's likely absence even more concerning, as Cannon has fared better than most against the Texans star in recent meetings. Without Cannon, who will wind up blocking the unstoppable Watt? Watt’s versatility highlights why, in addition to their obvious physical talent, this unit is so tough to block. These guys are capable of lining up anywhere and frequently move around, making it tougher to key in on anyone player with your blocking schemes. 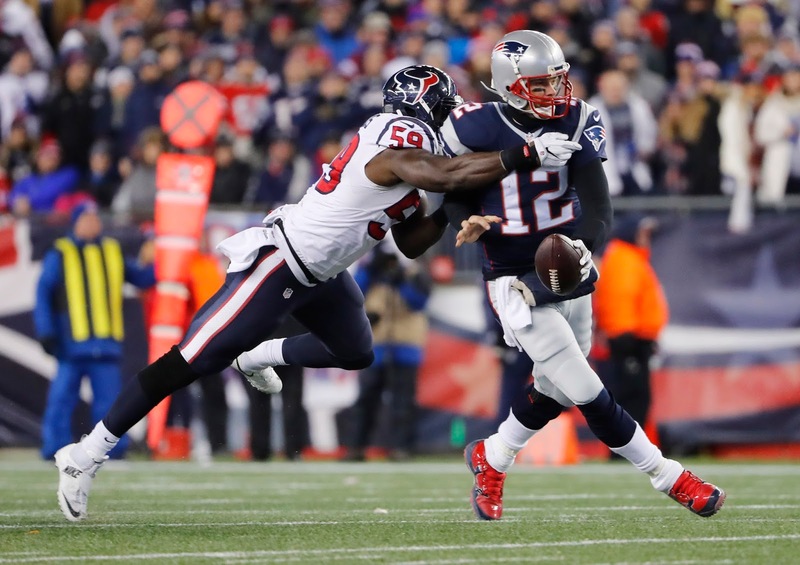 Patriots fans will remember the Texans taking Mercilus, typically an edge rusher, and lining him up on the nose, where he used his athleticism to make quick work of David Andrews. Clowney can also bump inside effectively as a rusher, while Watt has the ability to play any spot with ruthless effectiveness. Combine that with the vast arsenal of stunts and loops that defensive coordinator Mike Vrabel has at his disposal and you have a nightmare for an offensive line, both during the week preparation-wise and then obviously on the field. On one snap, you can be dealing with the technical precision and relentless attack of Watt, the next the brute force and size of Reader, the next the freakish speed of Clowney; sometimes without your assignment becoming clear until the last second due to disguises and stunts. This would be a tough one for the line even with everyone healthy and playing well, but it’s downright scary if Cannon can’t go opposite Solder. I’d expect the Pats to counter that obvious disadvantage by spreading the Texans out and attacking mismatches, with an major emphasis on getting rid of the ball quickly before the rush can get there. While running the ball would typically be a counter to a strong pass rush, New England’s undersized line isn’t built to pound the ball up the middle against a front like this. They haven’t even tried to run on this front in past matchups and I’d expect that to largely continue, although James White and Dion Lewis’ ability to force nickel looks could open up the possibility of draws being part of the game plan. Screens to those two could also be an important counter to a Texans rush that will be hell-bent on getting to Brady early and often. 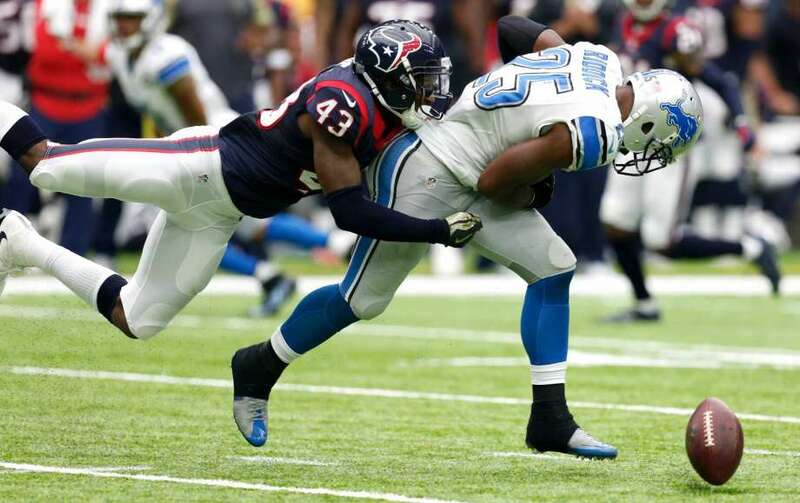 When they do attempt to run, they’ll be charged with getting a hat on both of the Texans active young linebackers. 2015 second round pick Benardrick McKinney (#55) has emerged as one of the league’s better young linebackers, thriving as an attacking downhill thumper. With Cushing suspended, he’s joined on the inside by this year’s second round pick, Vanderbilt product Zach Cunningham (#41). Reportedly a target of Belichick himself this spring, Cunningham was a tackling machine in college and has flashed instinctive play throughout a promising first two weeks. He’s a little on the lighter side and can get engulfed when bigger guys get their hands on him, but he excels at using his hands and athleticism to shed would-be blockers. These two are yet another reason why I’d expect the Pats to spread the Texans out rather than run right into the strength of their defense. While the Texans secondary still has some good players, it’s clearly the weaker half of their defense, particularly now that they’re down starting corner Kevin Johnson. That leaves veterans Jonathan Joseph (#24) and Kareem Jackson (#25), both of whom have had long productive careers but are past their athletic prime, as the starters, with recently signed journeyman Marcus Burley (#20) elevated to nickel status after Johnson went down with a MCL sprain last week. That’s a big blow for a defense that prefers to play plenty of man coverage. Whether or not the Pats can capitalize on the Texans weakened secondary will hinge largely on two factors: how healthy are the Patriots receivers, and how much time can the offensive line buy for Brady against the Texans front. Danny Amendola appears likely to play this week after getting cleared from the concussion protocol. His ability to separate from man coverage will be key in this one, particularly if he winds up drawing Burley in the slot. He combines with Brandin Cooks to give the Pats two supposedly healthy receivers, but Chris Hogan and Phillip Dorsett are wild cards. Both Dorsett and Hogan got dinged up last week with knee injuries, leaving both limited and practice and likely to be listed as questionable for Sunday. Even if those two are active, it remains to be seen how healthy and effective they can be. Dorsett didn't return to the game last week following his injury, while Hogan gutted it out but was visibly limited. With those two banged up, the Pats will likely turn to their backs and tight ends more in the passing game. Of course, how much they use their tight ends will hinge on how healthy Rob Gronkowski truly is. Gronk declared himself good to go today, but it remains to be seen if he will be limited physically or if the Pats will manage his snaps as he returns from a groin injury. If Gronk isn't healthy enough to be Gronk, it will be a huge blow, as neither Dwyane Allen nor Jacob Hollister have the burst to separate from man coverage the way Gronk can. There's less uncertainty at running back, where Rex Burkhead missed every practice this week with a rib injury and can be ruled out. Fortunately, the Pats have the horses at running back to survive the loss of Burkhead. It would've been nice to have Burkhead, who eats linebackers for breakfast in man coverage, but James White and Dion Lewis are both equally problematic for a matchup man defense. Look for the Pats to continue to utilize them heavily in the passing game, as their receiving game chops have been key to overcoming a rash of injuries at receiver. The Texans do have a number of good safeties to deploy against the Pats non-receiver skill players. Andre Hal (#29) has developed from a 2014 seventh rounder into a steady presence at free safety, earning himself a new contract this summer. He's joined in the starting lineup by Corey Moore (#43), a 2015 UDFA who appears to have secured a starting job this season after showing well as a spot starter last season. Moore is more of a box safety and thus is more likely to have some man coverage responsibilities, making him a guy to target if Gronk is remotely close to 100%. The Texans also have capable depth at both spots, with veteran Marcus Gilchrist (#40) backing up Hal at free safety and Eddie Pleasant (#35) giving them another proven option closer to the line of scrimmage. Improving on special teams has likely been a focus this week at the Texans facility, as their coverage teams got gashed last week by the Bengals. The kick coverage team allowed Cincinnati's Alex Ericson returns of 35 and 41 yards on his two opportunities. Meanwhile, the punt coverage allowed returns of 25+ yards to two different Bengals: Ericson and Pacman Jones. For the season, they are allowing absurd averages of 15 yards per punt return and 38 per kick return. Those numbers will go down as the sample size increases, of course, but they do illustrate just how much Houston struggled to cover kicks and punts last week. It's unclear if the Pats have the horses to capitalize on the Texans weak punt coverage, as they sent Patrick Chung out there to fair catch the ball every chance he got last week. If they throw Danny Amendola back out there to return them, he could have a chance to make a big play or two. Dion Lewis has handled kickoffs so far and needs no introduction to the Texans units after breaking a huge return for a touchdown in the playoff meeting last winter. Tyler Ervin has doubled this year as both the third down back and return specialist, handling all of the teams punt and kick returns through two weeks. He's been solid in that role, particularly on punts, as he's averaged a healthy 9 yards per return there. In the kicking game, punts are still handled by the ageless Shane Lechler, one of only two other active players remaining from Tom Brady's 2000 draft class (former Raiders teammate Sebastian Janikowski is the other). While Lechler is a known commodity, rookie placekicker Ka'imi Fairbairn is more of a mystery. Fairbairn's decorated college career actually ended following the 2015 season, but the UDFA landed on injury reserve and missed all of last season with a quadriceps injury. Healthy now, he beat out veteran Nick Novak for the job this summer and has made all of his kicks so far, albeit in a four attempt sample size.